The cries of “publicity stunt” and the assumption that both men were simply using the potential fight as nothing more than a ploy to keep their names relative at a time of mutual inactivity was pretty common. Fast forward to late August and those same doubters are left scratching their heads. While Conor McGregor has built the “Mystic Mac” aura around himself, a term which relates to his seemingly supernatural ability to predict the unknown and pull it off, the reality of why this fight is happening is far from beyond the material. In fact, one could argue that it is more tangible than that. An estimated $700 million dollars is set to be made from the “boxing bout” between the boxing luminary and his UFC lightweight champion opponent. 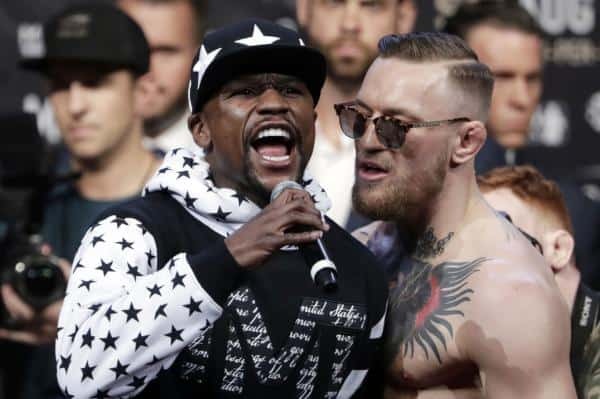 A Forecasted 5 million pay-per-views are expected to sell, which would break the previous record set by Mayweather and Pacquiao in 2015 (4.6 million). Mayweather is expected to surpass $1 Billion in total career earnings with a haul of $300 million for the fight, while McGregor will be set to pocket $75 million, effectively quadrupling his wealth. McGregor’s financial achievements over the past four years have been nothing short of truly spectacular. Having made his UFC debut in 2013, the Dublin-native admitted that he had been in receipt of welfare payments in Ireland. Less than five years later, he has a net worth of $34 million which is set to shoot well past $100 million following the fight. Should the unthinkable happen and he actually beats Mayweather, then it is unfathomable as to what he could potentially achieve in the next five years. The fight is set to attract millions of pay-per-view buys with the vast majority of those likely to be casual fight fans. Those unfamiliar with the defensive style of Mayweather and more familiar with the name and brand may, should the fight go as expected to plan for the boxer, feel a little cheated. The 40-year-old is, without a doubt, a sublime exponent of the sweet science and one of the greatest of all time, but his style is not exactly friendly to casual fans. Defensive prowess, excellent distance management, accuracy and the ability to ‘swim without getting wet’ are far from the desired qualities many expect from Mayweather. Granted, Mayweather will potentially fight slightly more offensively given McGregor’s lack of boxing experience, but the fact that the casual fan is expecting a slug fest makes for some disappointed customers post fight. To the boxing purists, anything less than a convincing knockout or stoppage will impress those who have any interest at all at watching the fight. The most realistic of MMA fans, or those with a decent knowledge of boxing, will be hoping for a huge upset but will no doubt understand that it is very unlikely. A more tangible consolation prize would be McGregor to land a few shots, maybe win a round or two and not get embarrassed. At $99.95 for fans in the U.S.A, this is a hefty price to pay to witness a miracle that will unlikely happen. The apparition of the Irishman standing above a defeated Mayweather is a sight beyond reality, even for MMA’s supernatural icon in the world’s Mecca of fighting. On the other hand, who knows? McGregor could shake-up the world and pull off what would be the biggest shock in boxing history. Forget Ali vs. Foreman or Douglas vs. Tyson, to see Conor McGregor’s name next to the only loss on Mayweather’s record would be absolutely insane. Anything can happen, yes, but the likelihood of this scenario playing out is extremely low. Profit, and not competition, is why this fight is happening. The fight will simply not be competitive enough to warrant the fleecing of fans and could potentially have an effect on how fans react to the next “super fight” thrown our way. If those who were disappointed after Mayweather vs. Pacquaio in 2015 are tuning in here, then they should prepare to feel even worse. The old boxing adage which accompanies a truly competitive, exciting bout “the fans are the true winners” will not apply here.